I say this just to make it understood that my feelings about Dunkirk are not disappointment. The movie absolutely delivers what the trailers promised, it’s just that, for this reviewer, that was nothing particularly compelling. If you saw those trailers and were immediately excited to see the movie as soon as possible, well… obviously, you’ve seen the movie by now, and I’m sure you loved it. There is nothing for you in the remainder of this review but frustration and rage. Fair warning. The other point to address is this: no, I didn’t see it in IMAX. According to the gospel, this is “the only way” to see Dunkirk, out of the four or five different options actually available. I did see it on 70 mm film, which I believe is considered the second-best way, and I did not enjoy it at all. I can’t emphasize that enough. So, unless the extra frame space of the IMAX format somehow magically imbued the story or characters with anything approaching real interest, I’m pretty sure I saw the same movie that all the IMAX acolytes did, minus that little extra something that tricked them all into thinking it’s a masterpiece. 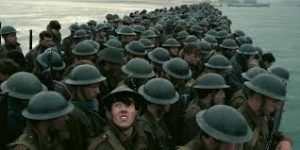 On a technical level, Dunkirk is undeniably impressive, and I’m sure that effect is doubled by the full immersion of the IMAX experience, but if that sort of total immersion is required in order to enjoy the movie at all, how great a movie can it really be? I’m reminded of Gravity, which was supposedly meant to be seen in both IMAX and 3D, or Avatar, which was a groundbreaking use of the 3D technology, and which undoubtedly loses some of its magic in any smaller-scale, 2D format. In both of these cases, after the initial razzle-dazzle of the theatrical experience wears off, the viewer is left with a couple of fairly mediocre stories (though both far more compelling than Dunkirk), and not a lot of actual replay value. If the only way to truly enjoy a movie is in its biggest, most prohibitively expensive theatrical format, then that is simply not a timeless movie. When you get beyond the razzle-dazzle of Dunkirk, there is basically nothing to recommend it. Even the most favorable reviews I’ve seen note that there is almost nothing in the way of character development or plot, before practically tripping over themselves to praise its technical verisimilitude. I’m not saying the movie needs a love story, or some sort of vengeance narrative, or a lot of big speechifying of the sort you see in most war movies; the respite from cliché is actually somewhat refreshing, or it would be if there was anything compelling in place of the clichés. Instead, it’s mostly just a lot of interchangeable British soldiers either dying (off-screen and/or bloodlessly, as this is a PG-13 war movie, after all, much as that is a thing that shouldn’t exist) or being afraid of dying. It has a lot in common with Terrence Malick’s similarly dull (and overrated) The Thin Red Line, which seems far from coincidental; Dunkirk feels like the kind of movie that craves Malick comparisons. Another technically accomplished but incredibly dull movie Dunkirk calls to mind is Martin Scorsese’s Silence, which was also a long-delayed passion project by an almost universally acclaimed filmmaker. I’m glad that these artists got to make the movies they’d so long envisioned; I just didn’t enjoy either one even slightly. In both cases (and in the case of The Thin Red Line, for that matter), I understand on an objective, intellectual level that what I’m seeing onscreen is the height of cinematic craft, a work by a true master filmmaker at the top of his game… and I could not care less, because my gut-level intuition tells me that I am bored to tears. Perhaps I really did miss a unique opportunity by not seeing this one in IMAX. There certainly were moments in the movie—particularly the fighter pilot sequences—that seemed like, in that fully immersive format, Dunkirk might be a hell of a ride. It’s just not much of a movie. nextBrigsby Bear – Make Something Cool With Your Friends! Excellent post. Which imp adds more pleasure. I hope in time this grows on you. Steel should last a lifetime.